Where can you get a genuine controller for £35? New sealed game is going for 12-15 max on eBay. Puts the controller at around 35, which is about the going rate. I'd expire this, if I were you! It's going to get veeeery cold. People like to say that on here whenever a controller deal comes up but never seem to actually post a link to one at that price. I look at this deal as the controller is £50 and you get a game free. I'd rather pay less for the controller and not get a free game to be honest. People like to say that on here whenever a controller deal comes up but …People like to say that on here whenever a controller deal comes up but never seem to actually post a link to one at that price. I'm after a 2nd controller and can only find them for £45, except on eBay which are no doubt fake. I look at this deal as the controller is £50 and you get a game …I look at this deal as the controller is £50 and you get a game free. I'd rather pay less for the controller and not get a free game to be honest. I'm after a 2nd controller and can only find them for £45, except on eBay …I'm after a 2nd controller and can only find them for £45, except on eBay which are no doubt fake. I've just been having a quick look to see if there are any good deals on controllers at the moment, the best I saw from a reputable seller was a blue official Sony controller for £42 including delivery from AO via their Ebay outlet. 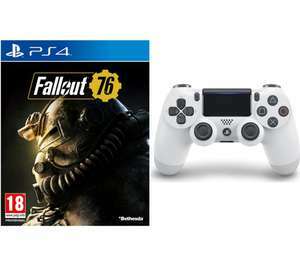 This is a good deal but i think so many are fooled by the fake PS4 controller's on ebay so down voted, heat from me for whats its worth and thanks for posting. They come up quite often, just need to look out for them. I have four controllers, never paid above £35. Got camo one for son last Christmas at £35. In other words, twice per year if you got one in time for a Christmas last year. Off me for a start as I sold a brand new black DS4 for £30 on eBay last week and actually still have a brand new Gran Turismo edition silver one up for £40 I'll accept £35 on, just putting it out there.